During Bare-Metal Foil lessons a slight mishap with an Exacto knife left a serious scratch inside the bed when foiling the bed strips. Pat's solution not only hid the damage, it greatly enhanced the visual appeal of the truck: he covered the inside of the bed with .010" diamond plate from Plastruct. This silver diamond plate along with the white interior brightened up what could have otherwise been a very dark truck. 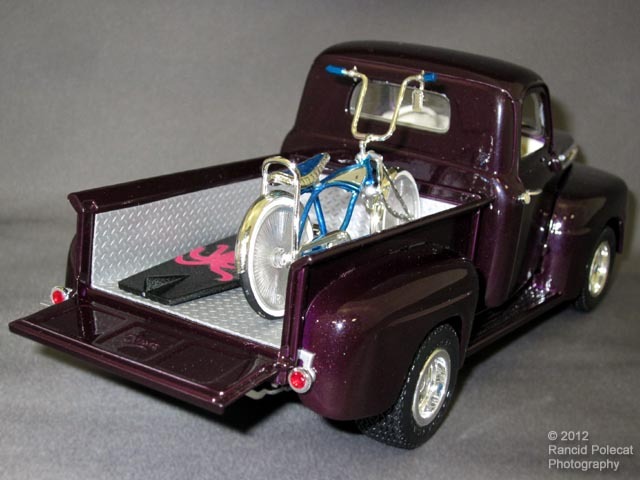 Pat also added some complementary color "pop" with a metallic blue and chrome bicycle from an AMT 1966 Riviera kit and a black surf board with pink squid graphics from a Surf Woody kit.